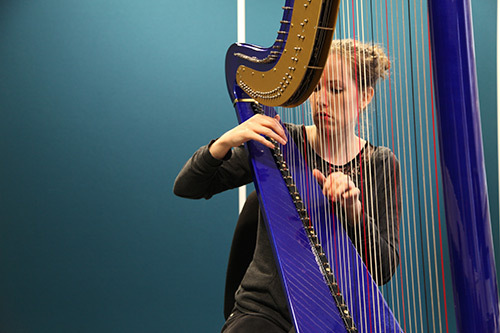 Úna Monaghan is a harper, composer and sound artist from Belfast, and Junior Research Fellow at Newnham College, Cambridge. Her research examines the intersections between Irish traditional music, experimental music practices, improvisation and interactive technologies. Her creative practice as musician, composer and sound engineer are reflected in a layered methodology that combines ethnography, composition, historical and musicological research, software and interface design, and performance. This seminar will discuss the composition and performance of work for Irish traditional musicians and live electronics, including the John Cage ‘Circus On’ score and its relationship to Irish traditional music and musicians in the 1970s and 1980s. Úna will describe her recent works for harp and electronics, a collaboration with fiddle player Paddy Glackin and poets Ciaran Carson and Cathal Ó Searcaigh, and the generation of ‘Irish traditional’ tunes by a machine learning computer system.